Where are we? Like Jeff Foxworthy says in his show, "Turn off the paved road..."
We are located on the O'Brien Ranch on South Cottonwood Creek in western Wyoming. The Ranch is approximately 25 miles northwest of Big Piney, and 30 miles southwest from Pinedale. We do not take drop-ins. Reservations must be made in advance. No matter which way you come to get here, you'll leave paved roads far behind and travel approximately 20 miles down a windy gravel road headed west towards the beautiful Wyoming Mountain range. The ranch is located at 7,500 feet elevation, and has views of the Wyoming Mountain Range, the Gros Ventre Wilderness Area and the Wind River Mountains. This is the heart of the historic Mountain Man country, the site of six of the 16 Mountain Man Rendezvous near present day Daniel, Wyoming near the confluence of Horse Creek and the Green River. The Rendezvous was a time to trade in the furs that were trapped for new supplies, as well as reaquaint with old friends. Lasting from one to two months, it was attended by as many as 4,000 Trappers and Indians. As you drive to the Ranch, you'll feel the worries and stress of modern life drop behind you as you drive into a slower pace of living and unhurried lifestyle. Watch for herds of antelope and deer in the rolling sagebrush hills along the way, and you might even see a badger along the road as you drive by. Folks you pass will probably wave at you. Smile and wave back. Everyone is friendly! Our Triple Peak Lodge is at the end of a dirt road, and we're the only place on it. 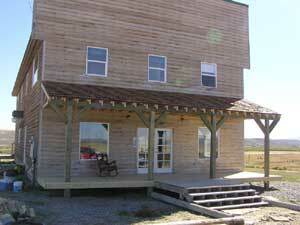 The Lodge is perched on a hill overlooking the South Cottonwood Creek valley facing the Wyoming Range mountains. The scenery is serene with miles of open country and nothing obstructing your view. You'll find the Lodge is a warm and friendly place where you can relax and where the outside world seems far, far away. About the Ranch The O'Brien Ranch has been in our family since 1950 and five generations of our family have lived here. The ranch covers over 360 acres and in the early years was a working cattle ranch. The Triple Peak Lodge and O'Brien Ranch main house are located on top of a hill overlooking an open valley with South Cottonwood Creek to the south and Killpecker Creek to the north (yes, there is a story behind that name) Three mountain ranges can be seen from the History Ranch, the Wyoming Mountains, the Gros Ventre Range and the Wind River Mountains. Triple Peak Lodge looks like an old historic hotel, complete with western looking old false front and narrow windows. Building the Lodge was a family project with construction completed in 2001, although some finishing touches still remain to the outside including the decks, front porch and landscaping. 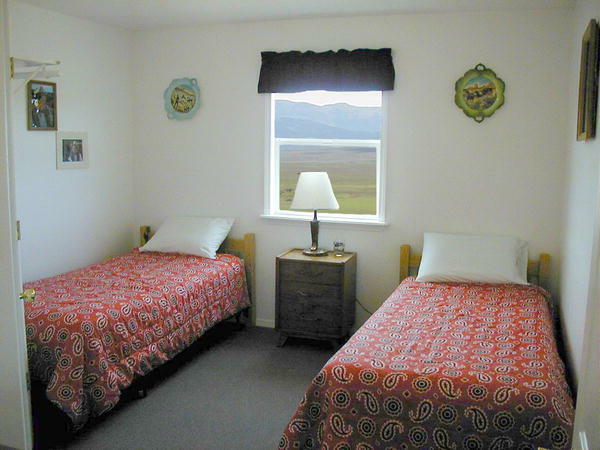 Eight guest rooms are located on the second floor and have great views of the Wyoming Range, Wind River Mountains, wildlife along South Cottonwood Creek and the South Cottonwood Creek and Killpecker Creek valley. Each of the guest rooms is unique and decorated in a different theme. Rooms vary in size, some have double and some with twin beds. (Room with twin beds can be converted to doubles.) 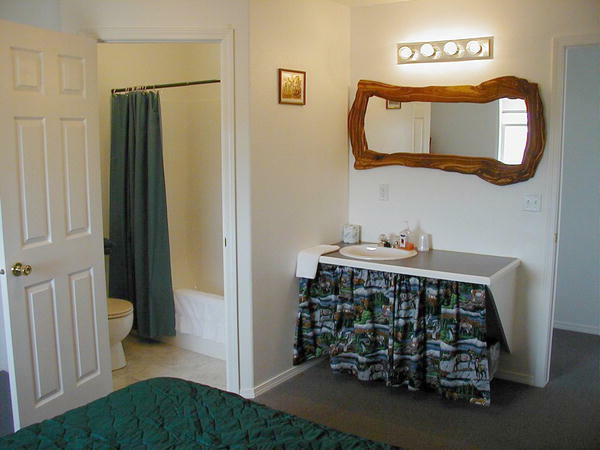 Each guest room has its own tub, shower and sink in the room. A living room gathering space is located on the main floor for casual conversation, reading, or enjoying the view of the mountains from the large windows. The lodge has cell phone reception for most providers and internet access. "Jedediah Smith-Mountain Man Room" This room pays tribute to these first rugged individuals who lived in this wild land. Mountain Men like Jim Bridger, William Sublette, John Colter and Osborne Russell braved the elements and wild animals, trapped, hunted and explored the entire Green River Valley and Wyoming territory. The Trappers came here to trap the valleys of the Green River for beaver, whose luxurious fur was used to make beaver hats, all the fashion in the early 1800s. The Trappers and Mountain Men were the earliest white people who lived in this area, before there were any roads or towns. They survived on their instincts, made their own shelters, hunted their own food and lived a way of life that is gone forever. 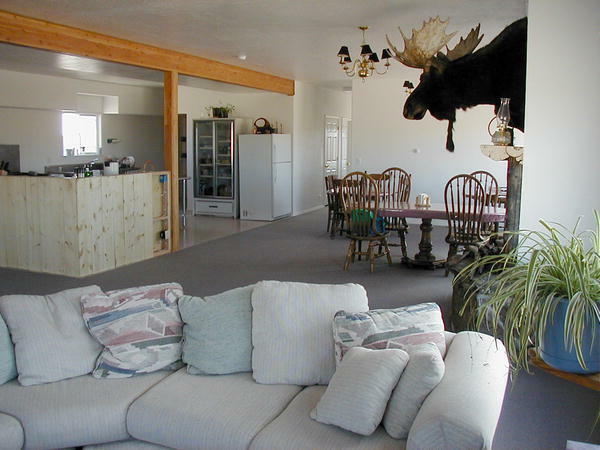 This is one of the larger rooms facing the Wind River Mountains and is decorated with wood furniture, tables & chairs. 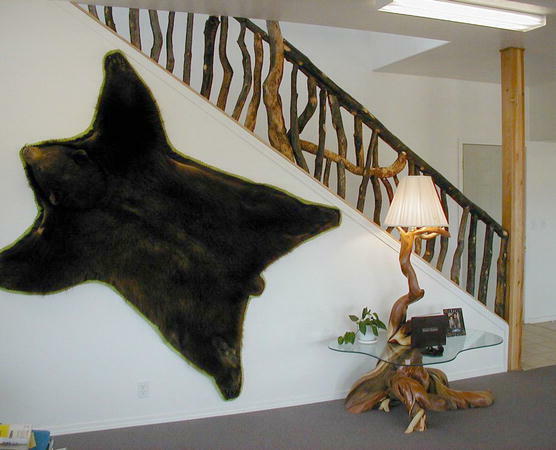 The wall decorations include snow shoes and historic pictures of famous Mountain Men. "Butch Cassidy-Outlaw Room" In the early frontier days the law was often far away and outlaws had their run of the land. Butch Cassidy and others are known to have been in the Upper Green River Valley running horses from eastern Wyoming, the Green River Valley over to Jackson Hole. Lookouts were posted all along the valley sidehills to warn the gang members if the Law was on its way. Remnants of old corrals, said to be used by outlaws running stolen horse rings, can still be seen today in the Upper Green River forests. This room faces the Wyoming Range and is decorated with pictures of famous outlaws and pieces representative of the period. "The Virginian-Cowboy Room" The book The Virginian is a classic western written in 1929 by Owen Wister, an American writer whose stories helped to establish the cowboy as an classic, individualist hero. Wister spent summers in the West, and on the basis of these experiences, wrote his Western sketches set in the Wyoming territory in the late 1870s and 1880s. Wister began writing his stories of America's last internal frontier. They paved the way for the novel THE VIRGINIAN: A HORSEMAN OF THE PLAINS (1902). The work was dedicated to Theodore Roosevelt, and in later editions had Frederic Remington's illustrations. The story of modest, quiet hero who was more comfortable with his horse than with other people gained a huge popularity. It was later filmed by Hollywood three times. In The Virginian Wister created the image of the West that was heroic as well exotic. Courageous but mysterious cowboy known only as the 'Virginian' works as a foreman of a cattle ranch. He meets a pretty schoolteacher Molly Wood, who introduces him the works of Sir Walter Scott, Shakespeare and Keats. However, their relationship is threatened by Trampas, who also works on the ranch. The climatic gun duel between the two men is the first "showdown" in fiction. In the end, the Virginian marries Molly and rides with her in the mountains. "Molly Wood-School Marm Room" Molly Wood was the pretty School Marm from Owen Wister's famous stories about "The Virginian", the classic Wyoming cowboy. The Triple Peak Lodge is located adjacent to a "School Section", a parcel of land set aside by the State of Wyoming so the revenues generated from the land would go to the schools in the state. During the homesteading years, the schoolhouse was actually located where our lodge is now, instead of on the School Section. The School Marm was typically a young girl who came from back East to teach and usually married a cowboy or rancher from the area. The School Marm typically taught children ages 6 through 18. 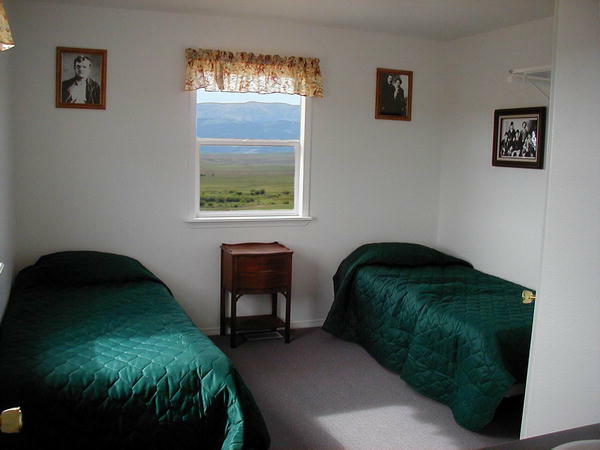 This room has two twin beds, painted furniture, and expansive views of the open pastures, Triple Peak and the Wyoming Range. 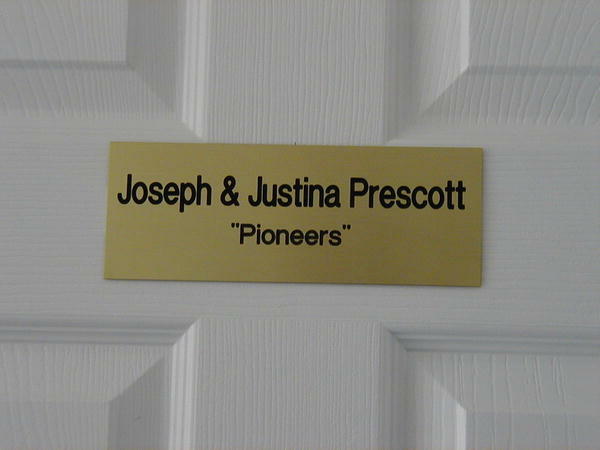 "Joseph & Justina Prescott-Pioneer Room". Our Great, Great Grandparents, Joseph and Justina Prescott, were pioneers who travelled from Maine along the Oregon Trail to the area that is now Baker City, Oregon in the 1870s. The Prescotts and their children were one family of thousands who used the Oregon Trail through Wyoming to reach a land that promised a better life. Ultimately, the Prescotts homesteaded in Durkee, Oregon. From our research we know that Joseph's grandfather was in the Revolutionary War and the orignal Prescotts came to the United States in 1665. This room has two twin beds and simple furnishings with views of the . 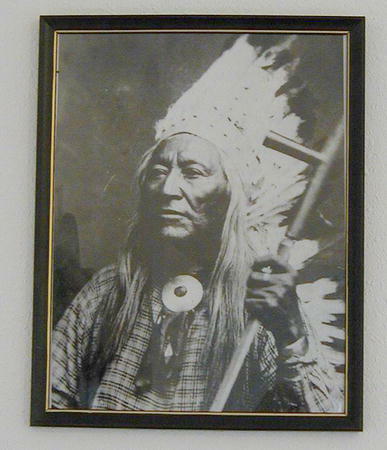 "Chief Washakie-Shoshone Indian Room" Washakie was chief of the Eastern Shoshone Indians of Wyoming during the 1800s. Washakie became a noted warrior. Although the name by which he would be widely known has been translated in various ways, it apparently dealt with his tactics in battle. One story describes how Washakie devised a large rattle by placing stones in an inflated and dried balloon of buffalo hide which he tied on a stick. He carried the device into battle to frighten enemy horses, earning the name The Rattle. Another translation of Washakie is Shoots-on-the-Run. He was also a scout for the U.S. Army. By 1850 Washakie was head chief of the Shoshones, apparently earning the position by his deeds in battle and wise counsel, though there is no record to show exactly when and under what conditions the decision was made. It is thought that the various Shoshone tribes may have united under one chief to deal with threats by hostile tribes, such as the Sioux and Cheyenne. Washakie became an ally of white men, deciding early that warfare was pointless and a policy of adaptation and mutual assistance should be followed. He assisted U.S. Army operations, with military forces and advice, against hostile tribes, particularly the Sioux and Cheyenne. Washakie granted right-of-way through Shoshone land in western Wyoming to the Union Pacific Railroad, aiding the completion of a coast-to-coast rail line. Washakie Pass is located in the Wind River Mountains to the east of the Lodge, a mountain pass route used by native Americans to traverse the rugged mountains between eastern and western Wyoming. 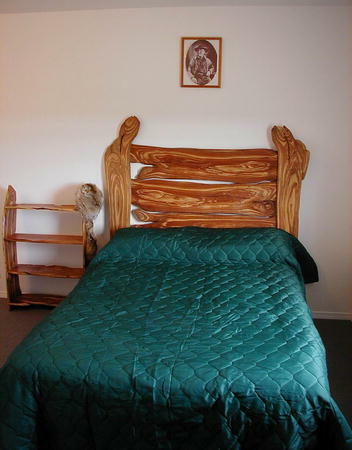 Two twin beds with native American design fabric bedspreads and curtains are in this room. This room has a picture of the great Chief on the wall. "Ann Bassett (alias Etta Place) Cattle Queen Room" Etta was a companion of Harry Longbaugh, "The Sundance Kid", and Butch Cassidy, members of the Wild Bunch Gang. Few facts are known about Etta Place and much of what has been written about her is romanticized. Her real name, and how and when she died, are uncertain. She has been described as the most beautiful and wildest of all women in the old west. This room is a favorite with the women-folk, with comfortable double size antique bed, red lace drapes, crocheted bedspread, and a lovely crystal chandelier. 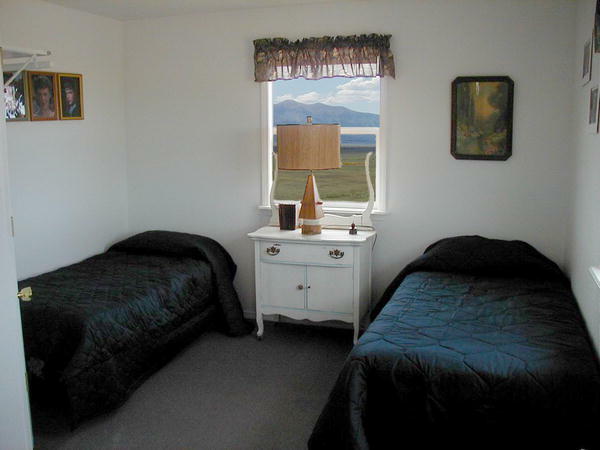 This large corner room has two windows, one with a view of the Wind River Mountain Range and the other facing south Cottonwood Creek, where deer and moose are frequently seen. 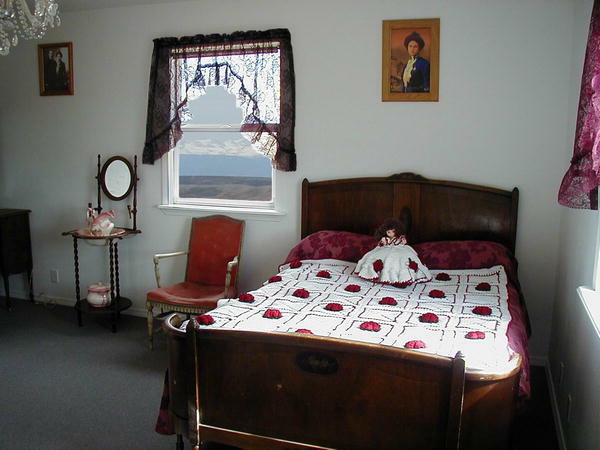 "Pat & Lura O'Brien-Homesteader Room" Our family's love for Wyoming began when our great grandparents came by wagon train from Denver to the Green River Valley around 1912 to homestead in what now is known as LaBarge. In the early years, this was a working cattle ranch with hay being put up with teams of workhorses. In more recent times, the ranch has been a retreat and haven for the members of our family. 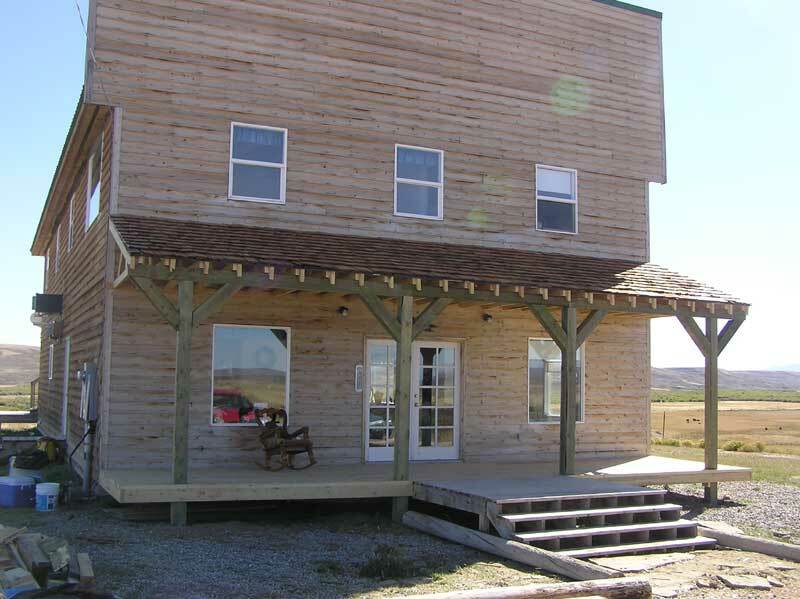 Family members built the original ranch houses on the property and each successive generation has added to the ranch. What has tied us all together are our roots to the land and our love for the country. The Ranch has always been a place that has meant "home". 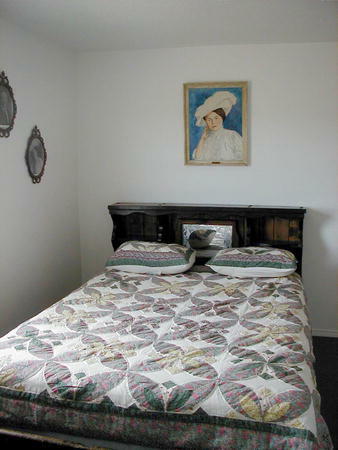 The room has a double bed with a quilt bed spread. A copy of the Prescott's mortgage is in this room.Pictures on the walls are of early area homesteads.